PM Netanyahu responds to Likud primary results, takes aim at rival Gantz. "I am pleased. The trouble is that Abbas is also pleased." 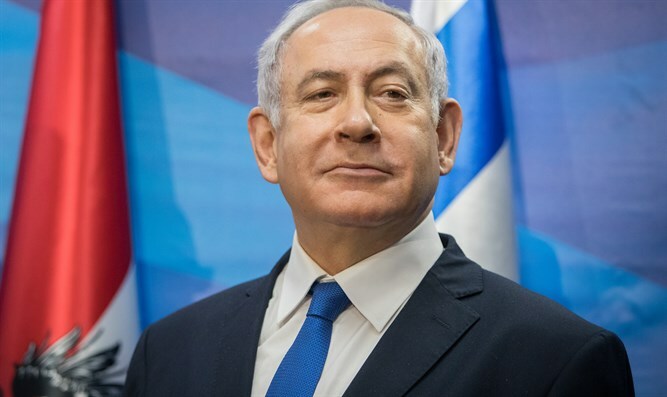 Prime Minister Benjamin Netanyahu welcomed the results of the Likud primaries to the 21st Knesset and attacked former Chief of Staff Benny Gantz, chairman of the Israel Resilience party. "I am very pleased that the Likud members have chosen, in a precise and democratic way, a strong, impressive list that is good for Israel. They also voted for my proposal,” Netanyahu said. "But the trouble is that Abu Mazen [Abbas] is also pleased, because Benny Gantz said today that he will carry out a second disengagement in Judea and Samaria and Abu Mazen wished him success in the elections. ''So we must go together, win these elections and prevent this. This is the real essence of the elections: A leftist government headed by Benny Gantz or a Likud government headed by me," the prime minister added. “The Israeli public will not again support someone who proposes evacuating Jews from their homes, even if he does so humanely and with sensitivity,” Bennett said. “Only a strong New Right will prevent the establishment of a Palestinian state,” he concluded.